Taxes are good for us, they say. Taxes help pay for the roads, the bridges, and the fire departments across the nation. 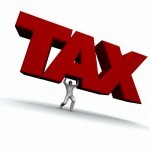 More recently, taxes have become a way to protect us from ourselves. Higher taxes push us away from all those horrible behaviors that society simply should not have to deal with. Taxes are the saving grace (although half the country pays no federal income tax)! Gasoline taxes – Gasoline taxes help us make the switch to better sources of oil, they say. Carbon taxes will make the planet healthier, and leave a better environment, proponents suggest. But the noise is just noise – gasoline gets taxed because it has inelastic demand (and Stop Whining About Gas Prices). No matter how high the tax, revenue will surely go up. Carbon is a great source of future tax revenue because it is literally in EVERYTHING. It’s simple chemistry, right? A carbon tax is a tax on anything organic. Anything and everything. What better way to raise funds than to tax EVERYTHING? Cigarette Taxes – Higher cigarette taxes help us pay for the costs of smoking cigarettes. Public health is affected by the people who choose to light up, which costs everyone money. This is absolutely nonsense. Again, cigarette companies enjoy inelastic demand for their products, meaning each increase in prices is matched with a much smaller decrease in consumption. It’s easy to tax smokers! Cigarette taxes are some of my favorite taxes, because such taxes only show the lies told by politicians. The truth of the matter is that cigarette taxes have nothing to do with public health, or public health costs. In fact, study after study has confirmed that smoking is good for public finances. While cigarette smoking is shown to increase health care costs (50 cents per pack smoked), smokers tend to die earlier than non-smokers. Discounting the savings back to today, researchers found that the economically efficient tax rate for cigarettes is actually negative 32 cents. Yep – if the government wanted to match the costs of smoking with appropriate taxes, it would have to subsidize the cost of each pack of cigarettes. Read: government should pay people to smoke if it wants to align taxes with a proper cost-to-benefit ratio for smoking. Just for reference, the current Federal tax on cigarettes is $1.01 per pack. State taxes can add considerably to the total level of taxation. But the truth is quite clear – cigarette taxes have nothing to do with public health. Cigarettes, much like gasoline and soon carbon, are just very easy to tax because they’re products with inelastic demand curves. More taxes always means more revenues, and the public wants nothing to do with logical policy. Feel good policy is preferable to better outcomes – some 60% of the American public (likely all non-smokers) support raising cigarette taxes before raising other taxes, or cutting any spending. Honesty may be the be policy, except in public policy. (For more articles calling BS on politicians and the mainstream media, visit the Criticism archives). 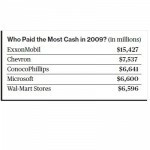 Guess Which 5 Companies Pay the Most Taxes? Nice one JT – of all the lies they tell related to taxes, the one I hate the most is the real motivation to tax any and all things as a pure MONEY GRAB. These inept morons that run our municipalities, states and federal government continuously find newer and even subtle things to tax just so they can spend more (actually, they don’t even pay off what they spend). Crazy. Yeah, it’s annoying how much we spend on projects to never be repaid. Municipalities are the worst players of massive “balance transfer roulette.” My municipality just spent millions for a new stadium, one smaller than the existing one just because the existing stadium needed some work. Rather than wait until the old stadium fell to pieces, they gave it the go ahead years before a true replacement would otherwise be necessary. Not surprisingly, the new build is also “paid for” with other excise taxes. Hospitality taxes, in this case. Very interesting about the cost of people who don’t smoke living longer. I had not seen that article. Perhaps the end goal of government isn’t just to save money, but to help people have a better quality of life. They have inelastic demand curves because an increase in prices does not lead to a proportional decrease in consumption. If gas goes up 10%, people do not drive 10% less. Maybe 3-4%, but certainly not 10%. A better quality of life is believable, but look to the arguments they use when new taxes are passed on cigarettes. It’s always about the cost of health care, when in reality, cigarettes are the best thing to happen to health care costs in a long time. The real problem is expecting that politicians will tell you the truth. They seem to say the right things to get elected and when they get to Washington or any government office, they do whatever they want. Cutting spending is almost the same, they do not approach the issues to really solve the problem. As citizens, we contribute to the problem and re-elect them. We get exactly what we deserve. This is why I no longer encourage people to vote. If someone needs encouragement to go to the polls, I don’t really want their vote to be counted. Don’t care enough to vote on your own? Well then, stay home! Yeah, I heard that story about the cigarette tax a while back. I’m still skeptical though. If a person lives a longer more healthy life, wouldn’t they contribute more to public finance through additional taxes and such? No. People who live longer collect social security, medicare, and a whole host of other public benefits longer. By the point most people near retirement age, the government has already sucked the vast majority of any taxes they are going to get out of them. Everything beyond that point is a loss from a public finance standpoint. Yep! And it’s important to remember that any money in the entitlement trusts is pretty much an illusion. The value of the Social Security Trust Fund is backed by US Treasuries, the equivalent to me saying that I have $500,000 in assets because I wrote myself an IOU for $500,000 one afternoon. Thing is, the entitlements have a discrete starting point at whatever age you select – 62, 66, or 70 years of age. Most people will live to 62-70 without any problem, paying taxes all the way. All things being equal, two people who start collecting at 70 and die at 75 and 80 years old have very different costs. The person who lives to 80 costs half as much as the person who dies at 75, even though the difference in longevity is a tiny 6% difference. That should read that the person who lives to 80 costs twice as much as the person who lives to 75 years old.